Last weekend the stars somehow aligned in Warrensburg, Mo. and the second First Fridays Art Walk in downtown coincided with the University of Central Missouri’s graduation weekend, resulting in a type of energy I’ve never seen or felt in this town. After work on Friday, I decided to go to Pine Street to check out the First Fridays Art Walk, which started in April. I assumed there would be a lot of activity that night. An electric feeling was in the air. I knew what I was looking for, and I knew I was hot on the trail of where I should be when I heard an amplified guitar cutting through the night air. I followed the sound and was led to Molly Gene accompanied by Jay Linhardt on drums on the sidewalk in front of Downtown Vibrations. Separately, Gene is known as the Molly Gene One Woaman Band, and Linhardt can be seen managing The Bay. With their powers combined, the pair is known as DOOMBLUES. This dynamic duo has only played live a handful of times, and seeing them rock out while posted on a sidewalk was a surreal and captivating sight. 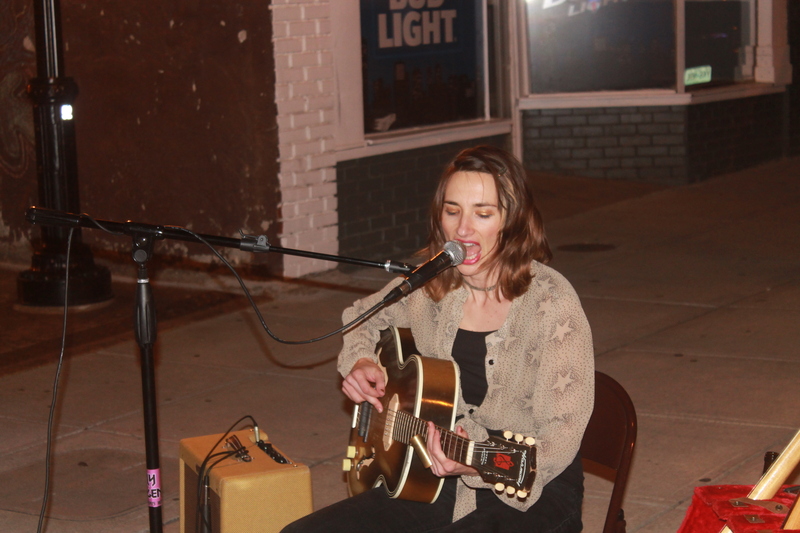 Molly Gene of DOOMBLUES plays in the street in front of Downtown Vibrations during the First Friday Art Walk May 5. The First Fridays Art Walk didn’t exactly feel like Warrensburg, maybe a little bit more like Lawrence, Kansas. Just a few years ago, the sight of what was happening would have been unfathomable. In the recent past there was a seemingly adversarial dynamic between the powers that be in this small, yet constantly growing college town and the local community of musicians and artists. Permitting a street festival focusing on the arts and live music could very well be an indicator of a new chapter concerning the social evolution in the ‘Burg. 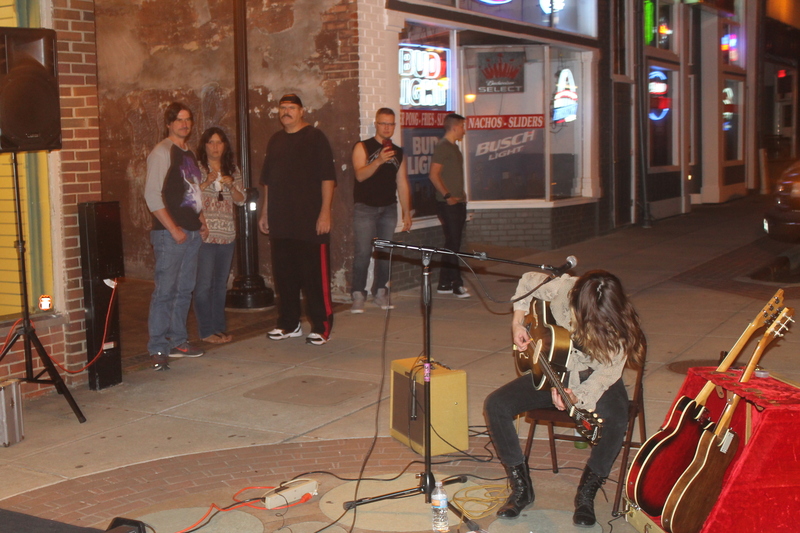 “We think a lot of people were surprised to see a band playing out in the middle of the street,” Linhardt said. Linhardt was also one of the main organizers of the event. The impetus for First Fridays Art Walk was born from the forming of the Warrensburg Arts Collective, and from there plans were put into action. “People have wanted to do this for a long time,” Lindhardt said. Another feature of DOOMBLUES’ set that added to my sense of disorientation was that Gene and Linhardt were facing each other while playing. I just assumed the drummer would be in the background, like every single rock act I’ve ever seen. I was curious as to how DOOMBLUES’ set would differ from Gene’s solo material. Her songs are intense on their own, but with a live drummer added, the sound became downright thunderous. Gene said a DOOMBLUES set is heavier than her usual set. “Jay is a really hard-hitter on the drums, and you can do more on a full drum set than you can on a foot drum, so there is more symbol action, and he’s been in metal bands, so I think it’s more heavy metal,” she said. Maybe some of the passersby were not prepared to encounter such auditory aggression, as I couldn’t help but notice their reactions and facial expressions. Along with the core group of fans that had assembled around Gene, the occasional curious man or woman on their stroll down the street would stop to check out the blues-meets-metal collision. I registered looks of shock and bewilderment on the faces of some walking by. Maybe the righteous rage of songs like “Roofied and Ripped Off” and “Uncle Sam” are not for everyone, but the beauty of the art walk was that there was enough variety present to suit varying tastes. After DOOMBLUES was finished, a hip-hop emcee by the name of Madness was set to perform at the same spot. 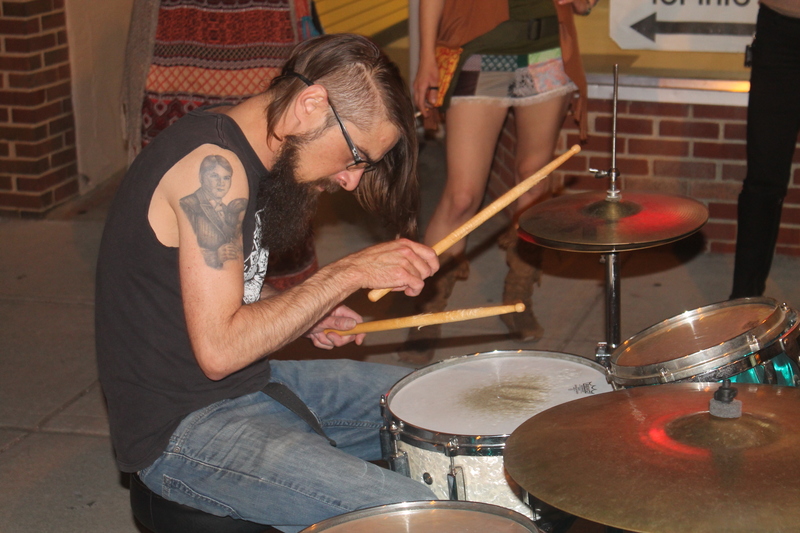 Jay Linhardt of DOOMBLUES plays during the First Friday Art Walk Friday May 5. Linhardt spoke of a spirit of connection and camaraderie present with First Fridays Art Walk. Follow Warrensburg First Fridays Art Walk on Facebook here. Follow the Warresnburg Arts Collective on Facebook here or attend their next meeting at 7 p.m. May 10 at Turner House Arts, 710 N. College Ave Suite E, in Warrensburg.